They say unto him, Why did Mosheh then command to give a writing of divorcement, and to put her away? 8 He said unto them, Mosheh because of the hardness of your hearts suffered you to put away your women: but from the beginning it was not so. Here, Rabbi YAHUSHA is telling us that there was a Torah that preexisted Mosheh, and which Mosheh changed because of the hardness of the hearts of Yashar’el. We have the example here that marriage and divorce was at least one of those changes. Arguably, food also suffered a new definition from seed-bearing fruit and vegetables to include “clean” animals. Because they had not executed my judgments, but had despised my statutes, and had polluted את my Shabbathoth, and their eyes were after their fathers' idols. 25 Wherefore I gave them also statutes that were not good, and judgments in which they should not live; 26 And I polluted them in their own gifts, in that they caused to pass through the fire all that opens the womb, that I might make them desolate, to the end that they might know that I am YAHUAH. Sacrifice and offering you did not desire; but a body you have prepared me: burnt offering and sin offering have you not required. Sacrifice and offering you would have no delight, but a body have you prepared me: 6 In burnt offerings and sacrifices for sin you have had no pleasure. 7 Then said I, Lo, I come (in the rolls of the cepher it is written of me,) to do your will, O YAH. Thus says YAHUAH TSEVA’OTH, the ELOHAI of Yashar’el; Put your burnt offerings unto your sacrifices, and eat flesh. 22 For I spoke not את eth-unto your fathers, nor commanded them in the day that I brought them out of the land of Mitsrayim, concerning burnt offerings or sacrifices: 23 But את eth-this thing commanded I them, saying, Obey my voice, and I will be your ELOHIYM, and ye shall be my people: and walk ye in all the ways that I have commanded you, that it may be well unto you. 24 But they hearkened not, nor inclined את eth-their ear, but walked in the counsels and in the imagination of their evil heart, and went backward, and not forward. 25 Since the day that your fathers came forth out of the land of Mitsrayim unto this day I have even sent unto you את eth-all my servants the prophets, daily rising up early and sending them: 26 Yet they hearkened not unto me, nor inclined את eth-their ear, but hardened את eth-their neck: they did worse than their fathers. 27 Therefore you shall speak את eth-all these words unto them; but they will not hearken to you: you shall also call unto them; but they will not answer you. 28 But you shall say unto them, This is a nation that obeys not the voice of YAHUAH ELOHAYHEM, nor receives correction: truth is perished, and is cut off from their mouth. Now, arguably, there are other statutes in the Torah which may be also inordinate, such as the practice of slavery discussed in the mitsvoth of Mosheh. How do ye say, We are wise, and the Torah of YAHUAH is with us? Lo, certainly the lying pen of the scribes has made it a lie. When we look at this verse, it opens many doors – maybe too many doors, since it would be easy to denounce virtually any Scripture with which you may have a disagreement. Are there any means by which we might find alterations of the original script, that would give us a shred of evidence how the Torah may have been altered by the pen? 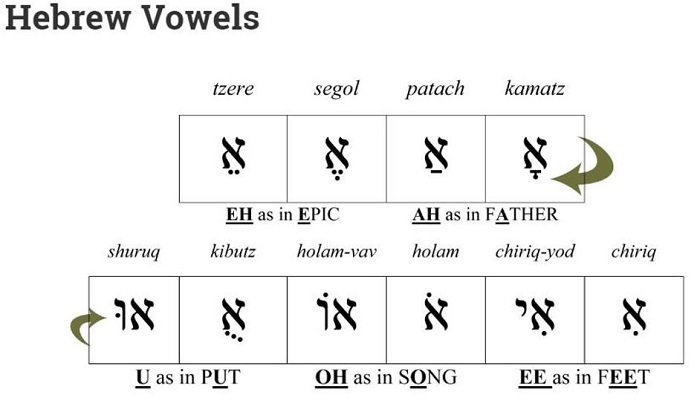 By adding vowel sounds to a language that already included vowel sounds (heh=AH; aleph=EH; yod=EE; vav=OO, OH, ayin=SCHWAH), which allowed the scribes to fundamentally alter the Torah to include and exclude, to alter and mislead. The nikkud is hard evidence of this verse. Wherefore YAHUAH also gave them up to uncleanness through the lusts of their own hearts, to dishonour their own bodies between themselves: 25 Who changed the Truth of YAH into a lie, and worshipped and served the creature more than the Creator, who is blessed forever. Amein. One marker of those who changed the Truth of YAH is that they are those who dishonor their own bodies between themselves. Consider who held the pen, and ask yourself whether they dishonor their own bodies between themselves. For we are not as many, which corrupt the Word of YAHUAH: but as of sincerity, but as of YAH, in the sight of YAHUAH speak we in MASHIACH. Before leaving this post, consider the corruption of the Word of YAHUAH. We at the Cepher Publishing Group, work hard to keep the highest integrity in interpreting the word. We believe that most interpreters did the same. However, there are those who have taken an axe to the Word, lopping off books that one man or one group of men believed should not be read; there are those who have systematically eliminated verses that they considered inappropriate; and finally there are those who manipulate the Word to claim it says one thing (lawlessness) when it doesn’t. Are they many? So the Leviyiym published all things to the people, saying, This day is holy to YAHUAH; be not sorrowful. 54 Then went they their way, everyone to eat and drink, and make merry, and to give part to them that had nothing, and to make great cheer; 55 Because they understood the words wherein they were instructed, and for the which they had been assembled.